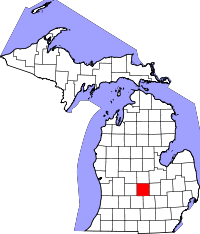 Clinton County is a county in the U.S. state of Michigan, and is part of the Lansing Metropolitan Area. As of the 2010 census, the population was 75,382. It is named after early American politician DeWitt Clinton. The county seat is St. Johns. According to the 2000 census, the county has a total area of 574.57 square miles (1,488.1 km2), of which 571.46 square miles (1,480.1 km2) (or 99.46%) is land and 3.12 square miles (8.1 km2) (or 0.54%) is water. As of the census of 2000, there were 64,753 people, 23,653 households, and 17,976 families residing in the county. The population density was 113 people per square mile (44/km²). There were 24,630 housing units at an average density of 43 per square mile (17/km²). The racial makeup of the county was 96.40% White, 0.63% Black or African American, 0.44% Native American, 0.52% Asian, 0.04% Pacific Islander, 0.81% from other races, and 1.17% from two or more races. 2.61% of the population were Hispanic or Latino of any race. 35.3% were of German, 11.4% English, 10.1% American and 8.5% Irish ancestry according to Census 2000. 96.4% spoke English and 1.9% Spanish as their first language. There were 23,653 households out of which 37.40% had children under the age of 18 living with them, 64.30% were married couples living together, 8.40% had a female householder with no husband present, and 24.00% were non-families. 19.80% of all households were made up of individuals and 7.10% had someone living alone who was 65 years of age or older. The average household size was 2.70 and the average family size was 3.12. In the county the population was spread out with 28.10% under the age of 18, 7.30% from 18 to 24, 29.20% from 25 to 44, 24.50% from 45 to 64, and 10.90% who were 65 years of age or older. The median age was 37 years. For every 100 females there were 98.90 males. For every 100 females age 18 and over, there were 95.60 males. The median income for a household in the county was $52,806, and the median income for a family was $60,491. Males had a median income of $42,379 versus $31,065 for females. The per capita income for the county was $22,913. About 3.30% of families and 4.60% of the population were below the poverty line, including 5.30% of those under age 18 and 6.00% of those age 65 or over. I-69 travels across southern Clinton County bypassing Lansing on the north. To the south, I-69 continues toward Battle Creek and Fort Wayne, Indiana. Easterly, the highway travels on to Flint and Port Huron. I-96 runs through the southwestern corner of the county before turning southerly to bypass Lansing. It connects Grand Rapids and Muskegon to the west with Detroit on the east. I-69 Business Loop or BL I-69 is a loop route running through Lansing and East Lansing. A small portion of the route exists in southeastern Clinton County. I-96 Business Loop or BL I-96 is a loop route running through Lansing. A small portion of the route exists in southern Clinton County. Capital Region International Airport (IATA: LAN, ICAO: KLAN, FAA LID: LAN) is a public, Class C airport located 3 miles (5 km) northwest of downtown Lansing, primarily in DeWitt Township. The airport accessible by Grand River Avenue (Business Route 96) and is located 1.5 miles (2.4 km) south of Interstate 69. Abrams Municipal Airport (FAA LID: 4D0) is a city-owned, public-use airport located two nautical miles (3.7 km) north of the central business district of Grand Ledge, a city in Eaton County. The airport is accessible by road from Wright Road (M-100), and is located 2.1 miles (3.4 km) south of Interstate 96, just east of M-100. The county government operates the jail, maintains rural roads, coordinates local emergency management, operates the major local courts, keeps files of deeds and mortgages, maintains vital records, administers public health regulations, and participates with the state in the provision of welfare and other social services. The county board of commissioners controls the budget but has only limited authority to make laws or ordinances. In Michigan, most local government functions — police and fire, building and zoning, tax assessment, street maintenance, etc. — are the responsibility of individual cities and townships. This page uses content from the English language Wikipedia. The original content was at Clinton County, Michigan. The list of authors can be seen in the page history. As with this Familypedia wiki, the content of Wikipedia is available under the Creative Commons License.